I lost a friend and colleague this past Sunday in a tragic accident that claimed her life. I'm going to miss you, Liz, I will remember you as that geeky, goofy girl with infectious laughter, a ready smile, pithy comments, and with the strength of ten for your heart was pure. 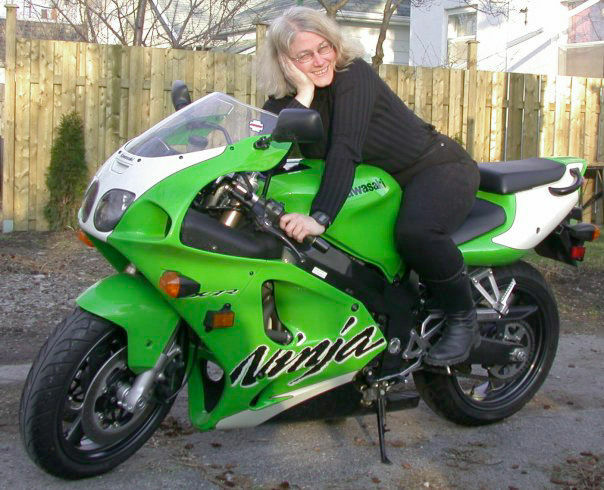 As an instructor with Learning Curves she brought years of practical experience to her students, and she did her best to coach students past their faults towards better riding habits. I loved working with her, as she brought positive energy, that smile, and her "Let's get this done and call it fun!" attitude every time she was on the lot. She excelled at coaching, and her loss is felt most acutely by my colleagues and her friends. Those "media hound" tweets of hers were all over the map, as she had varied interests and tastes. I'll miss those quite a bit. She was directly responsible for suggesting a means for enabling Suzi to ride in comfort with me on our tours aboard the KLR. Thanks Liz, Suzi and I will never forget. Liz, So long and thanks for all the fish. Your friends, Ron and Suzi. Goldie and Don did a great job speaking on behalf of the motorcycling community that is reeling in shock at the loss of one "good" ones. What can I say about the accident speaking as an enthusiast and motorcycle safety course instructor? We can gain experience, achieve skilled control of a machine in good working order, yet still be become involved in a collision due to circumstances beyond our control. At this point we have a decision to continue riding in spite of the inherent risks or to put the bike up for sale. Should the choice be to continue riding, we can limit our risk by ensuring that we remain visible, that we leave a large space cushion, and operate with care and pride. At the end of the day, let those around you know that you care about them, and program an In Case of Emergency (ICE) contacts into your cell phone so that next of kin can be notified promptly. If you really want to make a difference, I encourage you to take an Emergency or Standard First Aid course with CPR. Check with your local St. John's Ambulance. I made arrangements to attend the funeral, and a meeting spot at Kahuna cycle was arranged by a friend of mine, James "No E at the end" Bai to meet at 12:30 for a group ride to the funeral home. I thought this was a fair sized group. The Southern Cruisers wheeled in as well. Taken by Michael Kazdan , Southern Cruisers Riding Club, Chapter 383 Toronto Ontario. Friend and Club Member of Liz Metcalfe.Gone too soon. We stretched from hill to hill and beyond. Liz leading us all. The Southern cruisers pulling up the rear. Liz would have enjoyed the roundabouts and twisties. When the service concluded, we were asked to help fill her grave, something friends and family would do for those they loved, a favour that could never be repaid by the one it was meant for. Elaine celebrates the friendship and life of our friend. We've cleared the place out, and it's time to bid farewell. Liz, your friends threw you a ride and party to be proud of, every single person there because they were connected to you in love, friendship and enthusiasm. I was deeply moved to be a part of it, honoured and blessed to have called you my friend. Rest in peace while we keep the memories alive. A great tribute to a great friend and colleague. I too am still missing her. I find myself wondering, "Hey I wonder what Liz thinks about ." At first that saddened me but then I realized how wonderful it was to know her and to chat with her ... a real blessing.